The Department of Electrical and Computer Engineering of Iowa State University is a basic administrative unit of education, research, and service within the university. The purpose of these bylaws is to establish a democratic framework in which members of the department faculty can work together to meet their academic and administrative obligations. 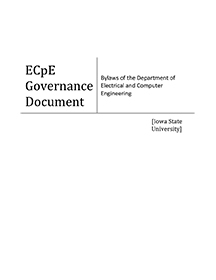 These specific departmental bylaws define the responsibilities of the members of the Department of Electrical and Computer Engineering of Iowa State University and supplement those of the University and those of the College of Engineering. These bylaws outline procedures to be followed in formulating faculty decisions necessary for counseling with the Department Chair. All university and college procedures take precedence in case of a conflicting situation.